I am so blessed to have a beautiful, healthy, intelligent and loving daughter. We adopted my daughter in Russia when she was 3 years old and I can honestly say it was the best decision we ever made. One of the questions that adoptive parents have to deal with is how to share information with their child about their adoption and family of origin. Depending on the situation there may be details that simply aren’t suitable for a young child to hear. Because of my daughters age and the fact that we have an older son there was never any point where the fact that she is adopted was not openly discussed. She feels special because she was adopted. Ironically she looks more like me than my biological son does so sometimes when she tells people that she is adopted they don’t believe her! I was lucky enough to receive copies of the court documents from my daughter’s custody hearing when her biological family lost custody. Many families do not have as much information as I do and so they can only speak to the social situations of the country of origin. 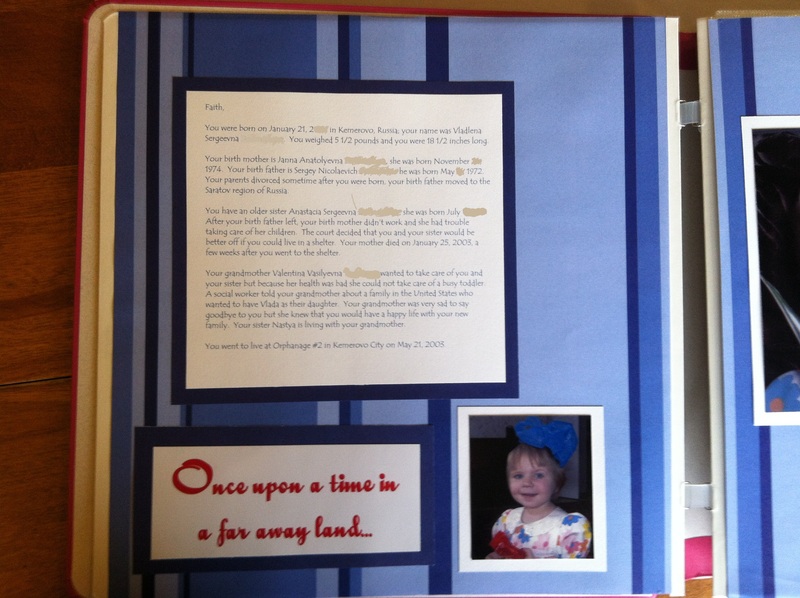 I decided to create a scrapbook of our adoption story for my daughter and to include her basic history. As she gets older I can give her more specifics but she has all the basic facts now. She refers to her book often and has memorized many of the details. Her birth Mother died shortly after she lost custody and my daughter remembers the anniversary of her Mother’s death each year and we say prayers for her together. I decided to type up her history as if I was writing her a letter and to place it in the first page of her book. She can decide who she wants to show her book to. We have an agreement that her adoption story is hers and she is the only one who can volunteer the information to someone new in our lives. This came from me embarrassing her by sharing the story with anyone I met because I was so proud of her and her story! Of course I will ask her permission before I share this on my blog. I also believe that as an adoption success story we have a responsibility to share our story so that it might help other people who are either considering adoption or are unsure about what to share with their child about adoption. 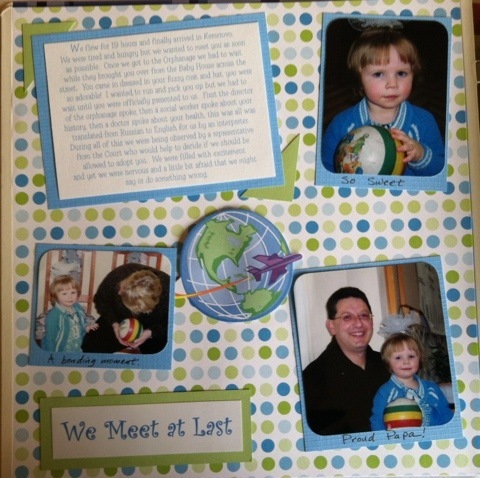 When we began our adoption process I heard nothing but horror stories from “well meaning” friends and acquaintances. Yes, there are bad adoptions just as there are bad births. The bottom line is that when you have a child you must be ready for anything and to do your best to overcome any obstacles that come your way. So these are a couple pages from my daughter’s scrapbook, I know that they aren’t the best artistically but they tell her story,it is her beginning and the future is up to her. 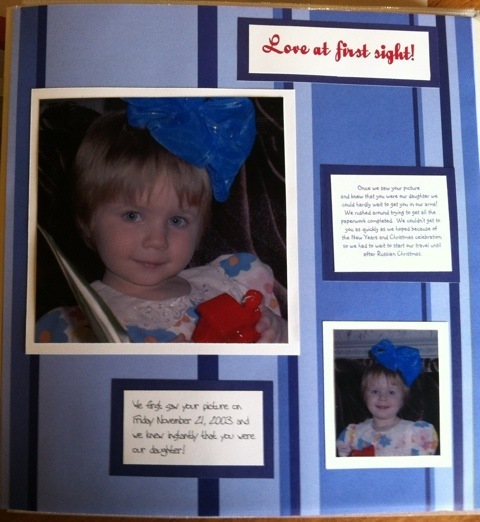 SO touching seeing her picture and thinking she was so far away. Thank goodness you found each other. I was also touched hearing that you pray on the anniversary of her birth mother’s death. Hi to Faith, from Mrs. Ortlieb!